In this ABAP tutorial, ABAP developers can find code that shows how to upload data from Excel file to ABAP internal tables using TEXT_CONVERT_XLS_TO_SAP function call. ABAP function module TEXT_CONVERT_XLS_TO_SAP is used for uploading from Excel data into SAP tables or ABAP internal tables. To show how to upload from Excel data file, I have exported some data outside SAP system from MS SQL Server 2008 AdventureWorks database. The vendor data from database is exported to Excel file and the below ABAP report/program will import or upload data from excel to ABAP internal table. The UPLOAD_FROM_EXCEL sample ABAP program has a SELECTION-SCREEN where ABAP users or SAP users can select source file for Excel data. The selection-screen uses cl_gui_frontend_services=>file_open_dialog method for displaying Windows type file exporer for file open dialog screen. 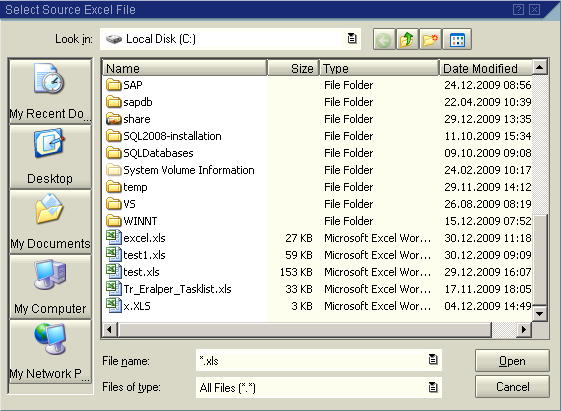 After the Excel file for data upload is selected within the file open dialog screen, the UploadExcelData form routine and DisplayInternalTableData form routine is executed in order. UploadExcelData loads Excel data from selected Excel source file to target ABAP internal table using the ABAP TEXT_CONVERT_XLS_TO_SAP function call. While TEXT_CONVERT_XLS_TO_SAP function call, it is important to set the internal table suitable for the source file. For this reason, I have defined a custom type gty_Vendors in TYPES declaration section. And a work area gs_Vendors and internal table gt_Vendors declarations are made using this global type. After type declarations and data definitions are carried out, I used i_tab_converted_data property of TEXT_CONVERT_XLS_TO_SAP ABAP function to point to the target internal table for Excel upload process. The DisplayInternalTableData form simply loops within the internal table and displays vendor information on screen using WRITE method. gt_Vendors TYPE TABLE OF gty_Vendors. SELECTION-SCREEN BEGIN OF BLOCK BLOCK-1 WITH FRAME TITLE TEXT-001. PARAMETERS : pa_file LIKE rlgrap-filename DEFAULT 'C:\excel.xls'. SELECTION-SCREEN END OF BLOCK BLOCK-1. FORM U_SELECTFILE USING P_PA_FILE TYPE LOCALFILE. LOOP AT lt_it_tab INTO p_pa_file. LOOP AT gt_Vendors INTO gs_Vendors. I hope you find this ABAP Excel upload demo useful for your ABAP codes used in order to load excel data.